The UFC’s return to London, England, which goes down on March 16, could be bolstered by an exciting light heavyweight attraction. On Saturday night, amid the excitement of UFC 232, BJPenn.com’s Tom Taylor reported that a fight between former title challenger Volkan Oezdemir and surging contender Dominick Reyes is in the works for the card. I’m told a light heavyweight fight between Volkan Oezdemir and Dominick Reyes is being worked on for #UFCLondon on March 16. Still early stages, but it’s on the table. Volkan Oezdemir last fought in late October, in the main event of the UFC’s stop in Moncton, New Brunswick, Canada, when he came up short in a fun fight with the streaking Anthony Smith. In his next most recent fight, he was stopped by Daniel Cormier in a light heavyweight title fight. Prior to these losses, Oezdemir began his UFC career with a 3-0 run, composed of a decision defeat of Ovince Saint Preux, and a pair of first-round KOs over Misha Cirkunov and Jimi Manuwa. He’s 15-3 overall. Dominick Reyes, meanwhile, is a perfect 10-0 overall. In his last fight, which occurred at UFC 229 in early October, he picked up a dominant decision defeat over Ovince Saint Preux. This victory was preceded by UFC defeats of Jared Cannonier, Jeremy Kimball and Joachim Christensen — all stoppages. The UFC London card, which will go down inside the O2 Arena, is still in the early phases of being constructed. The only fight that’s official for the card so far is a middleweight bout between Tom Breese and Alessio Di Chirico. 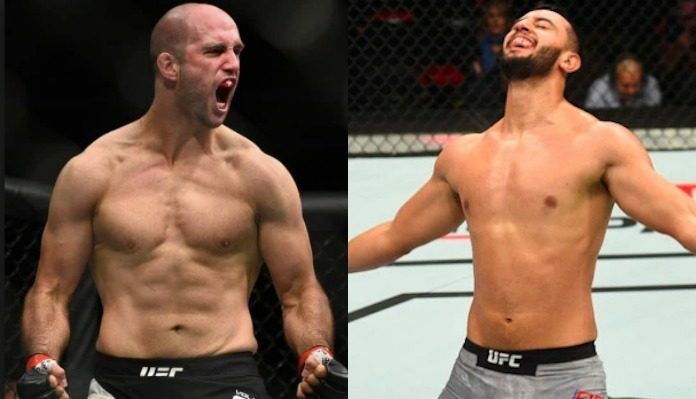 If Volkan Oezdemir and Dominick Reyes end up meeting at UFC London, who do you think will come out on top?